The LG Smart Watch Sport uses the latest Android Wear 2.0 from Google and is one of the best Fitness trackers with various training modes incorporated into the smartwatch. The watch comes with a robust design that is both swanky and gives you that geeky suave look with components like the LTE antenna which extends into the wrist strap with extensive room for customisation. The LG Smart Watch Sport only comes in 2 colours; a blue and grey anodised casing colours with an attractive brushed metal frame designed to showcase the Android Wear 2.0 operating system specifically. 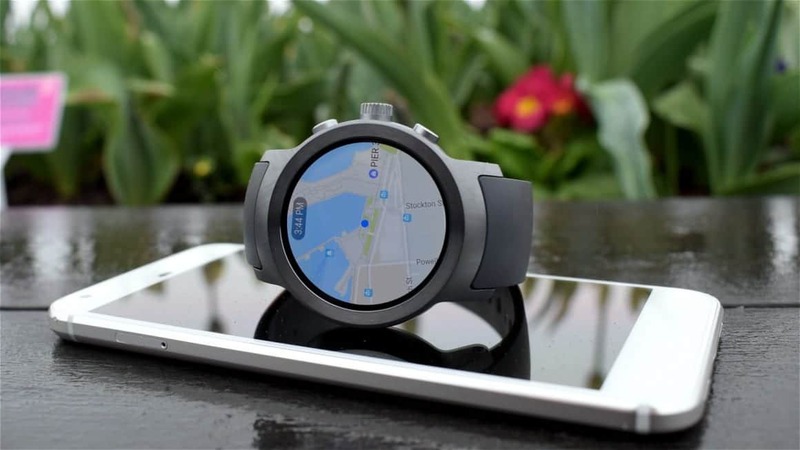 The sturdy smartwatch which was probably the first with an LTE connection, functioning very well without any need to have your phone nearby. The fitness tracking device has loads of built-in features like a heart rate monitor, waterproof casing, GPS chip, and barometer to give accurate fitness monitoring data you can get from any other device. It can also track strength training. The design and performance are impeccable; it has a high-resolution screen display flanked by little bezels that looks classy and swanky on your wrist. LG Watch Sport has a 1.38 inch OLED display and 480 x 480 display sharp and visible even in the brightness of daylight without having to increase the intensity. It has a 348ppi screen display and 14.8mm tall that carries all the functionality it comes with. Features like the built-in NFC chip, GPS, and Android Pay which allows you to make purchases in stores from your wrist. Its Bluetooth connectivity allows you to pair it with a wireless headphone and stream music from Spotify thanks to the LTE radio built into the device extending to the straps. The operating system upgrade allows you to personalise your device and access to a third-party app which allows you to view information directly beyond the reasonable time, date and battery display without having to waste your time fiddling around. This means watch face personalisation is more accessible than ever without much effort. There is no need for hassling and stress as information and other functionalities are now available on your smartwatch without having to bring out your phone. Google Fit on the Sport device has been improved having its own dedicated quick start button that tracks speed, time, heart rate, running pace and more while cycling or doing other sports. It is very nice for monitoring your workout session with features like measuring training reps, press ups, chin ups, deadlifts, biceps curls and so much more. The elegant digital crown allows you to scroll and navigate around the menu without having to touch the screen supporting rotational input in case your hands are dirty or sweaty. Also, there are two buttons each present on either side of the crown each opening an app of your choice for example by default the top button opens the workout menu. This can be changed to access any other feature of your choice, making it faster to access features faster. It runs on a 1.1GHz Snapdragon wear chipset and 768MB RAM with a 430mAh battery which last days on basic use. The LG Watch Sport is a blend of both a smartwatch as well as a Fitness tracker and comes in a fancy design that is very fashionable.